Seems so. A study that was recently published in the Public Health Nutrition Journal has given some new evidence that sugary soft drinks could increase the risk of cancer, no matter the weight. This adds to the existing knowledge on the effect of soft drinks on our health, most of which has been linked to weight, and consequently weight related problems, including cancer and other non-communicable diseases. The study which was conducted in Australia is one of the first studies to show an association between sugary soft drinks and the risk of cancers which specific to the study were; endometrium, ovary, kidney, gallbladder, liver, oesophagus, aggressive prostate, postmenopausal breast, pancreas and colorectal. From the study, even people who were not overweight but regularly took sugary soft drinks had an increased risk of developing cancer; and the more sugary soft drinks the participants took, the higher the risk of developing cancer became. This however was not the case for the participants who took diet soft drinks, implying sugar could be a contributor. Further, when the high consumption of sugary soft drinks was compared with similar consumption of artificially sweetened soft drinks, the cancer risk was only seen among those who took sugary soft drinks. 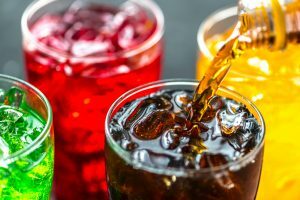 Even so, the study showed that those who regularly took diet and artificially sweetened soft drinks were as likely to be obese as those who drank sugary soft drinks. They were both, associated with higher waist circumferences. Soft drinks date back to many years. However unlike couple of decades back when such drinks were “occasional”, soft drinks are as easy to get as having one brought to you in traffic. Fortunately, anyone selling soft drinks, is also highly likely to be selling water. If I were you, I’d take the water.